Was Kavanaugh a Good Choice? There are REAL Catholics in more than name only and there are frauds masquerading as Catholic. The frauds are well known as far as I'm concerned with Kennedy, Roberts and Sotomayor in that category. Kennedy is about as Catholic as a cockroach. He authored some of the most horrendous decisions trashing a moral order rooted in obedience to "the laws of nature, and of nature's God" that the founders of our country realized was necessary for its survival, which is why, for me, Trump's stupidity about this creep being praiseworthy was nauseating. For the love of God, history tells us that civilizations die when the moral order is trashed and anarchy prevails! We don't need any more swing votes. As I see it now, we have only Alito, Thomas and Gorsuch to be confident of consistently doing the right thing. It would be nice to have a warm feeling about Kavanaugh, but I don't. To say that he will NEVER be a Souter is premature in the extreme as I see it. It's a pity that we will have to wait to see what he will really do, and hope and pray that he will do the right thing, instead of coming out of the chute confident that he will. I didn't vote for Trump for more "swing" votes! Bottom line, I'm very leery of a nominee that clerked for Kennedy as opposed to Scalia when the latter was available, especially when that nominee came with Kennedy's warped blessing! Time will tell. I only hope that I'm wrong, but right now, I fear I'm right! We know what happened with the last Bush recommendation with the unconscionable unconstitutional ruling in support of Obama's death care, lest we forget. Regarding your article entitled, “Card. Dolan with Pro-abortion Homosexual Irish PM,” what’s wrong with these pictures? Did you notice that Cdl Dolan has the altar boy in a near headlock? How very possessive! He has his hand on a second boy in another photo. These really bother me. It’s as bad as photos/videos I’ve seen in the past of Joe Biden groping little girls! My two younger brothers (who are in their 50’s now) were altar boys. Not once have I ever seen a single priest handle my brothers in this manner! I wanted to call it to your attention. Regarding women in combat, this is one place where any studies or statistics that don't say what the feminists want to hear are just disregarded. 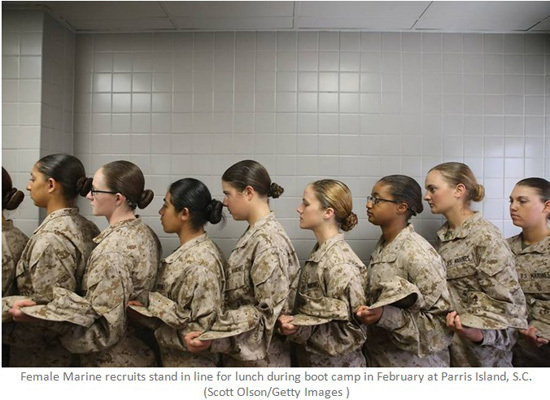 It makes me sad to see this line of women in the Marines. A study confirms - they don't belong there. But the study doesn't fit the politically correct dictates. Below is a letter to the Washington Post Editor I thought was quite good. It is from 2015, but its conclusions are still very timely. I was struck by Navy Secretary Ray Mabus’s reaction to the Marine Corps’s findings on the performance of women who were tested in infantry skills. Despite the women’s poor showing, which consistently degraded the combat performance of their integrated teams, Mr. Mabus did not “see a reason” to exempt women from combat arms. That position ignores the study’s findings. The essence of battle at the tactical level is to kill as many of your enemies as necessary while minimizing your side’s casualties. According to the study, integrating women into combat arms reverses this timeless principle by weakening the Marines. We cannot wish war away; it is unconscionable not to do everything possible to maximize our troops’ chances for battlefield success while minimizing their risks. Let’s not succumb to the politically fashionable idea that men and women are equal in all things, including battle. Let’s continue to exclude women from the infantry, artillery and armor branches of our armed forces. Perhaps Mr. Mabus should poll the mothers, daughters and wives of Marines to find out what they think about the increased risks that their sons, brothers and husbands will face on the battlefield if women are integrated into combat arms. Folks, the time for sitting on the sidelines had passed. I truly regret saying that the Catholic Church is now a major player in the global campaign to institutionalize the legalization of euthanasia. The tsunami is here. Palliative care is not what it used to be! Those who are building the field of palliative medicine need to be exposed. This article makes it easier to begin to educate. We pray the Holy Spirit will guide in battle. WASHINGTON – July 5, 2018 – Toward the end, the pain had practically driven Elizabeth Martin mad. Ms. Martin fantasized about having her sister drive her into the mountains and leave her with the liquid morphine drops she had surreptitiously collected over three months – medicine that didn’t relieve her pain but might be enough to kill her if she took it all at once. Ms. Freeman couldn’t bring herself to do it, fearing the legal consequences and the possibility that her sister would survive and end up in even worse shape. Under palliative sedation, a doctor gives to a terminally ill patient enough sedatives to induce unconsciousness. The goal is to reduce or eliminate suffering, but in many cases the patient dies without regaining consciousness. Doctors wrestle with what constitutes unbearable suffering, and at what point palliative sedation is appropriate – if ever. Policies vary from one hospital to another, one hospice to another, and one palliative care practice to another. “If you are starting the death-with-dignity process, you’re not at a point where a doctor would recommend palliative sedation,” Dr. Back said. “And with terminal sedation, the patient doesn’t have that kind of time and is too sick to take all those meds orally,” he said of the aid-in-dying drugs.